Do prunes taste like plums? how do I reach?, originally uploaded by shaunaforce. One of the gifts of being a full-time writer is that I have time to procrastinate in truly useless ways. Don’t worry — the writing of the book is full-speed ahead. In fact, with any luck, I will be halfway through the manuscript at the end of next week. The contract for this book deal requires me to write quality prose in voluminous quantities every day. Luckily, this matches my temperament just fine. Tell me I can’t make a challenge, and damn it, I’m going to do it! However, any act of creativity requires a certain degree of procrastination. That’s where the best ideas emerge. Someone once said — and if you can remember who, let me know please; it’s driving me crazy — that writing a book requires a lot of looking out the window time. Well, instead of looking out my window all the time, sometimes I look at my site meter. Endlessly addictive, this activity allows me to know how many people are coming to this site, and from where. 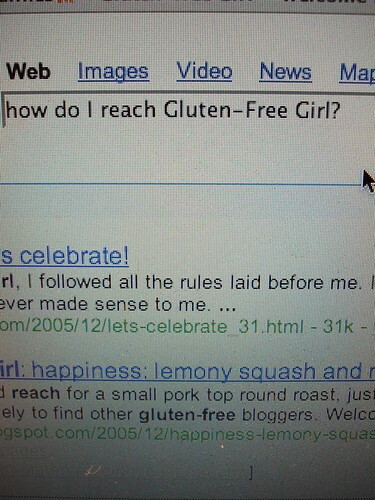 For all of you who have sought me out deliberately, by typing in “gluten-free girl” or “celiac blog” or “gluten girl Shauna” on Google or Yahoo or MSN, then welcome! Some of you have come to this site because you have typed in a desperate search like “Do potatoes have gluten?” or “Do pomegranates have gluten” or “Does yogurt have gluten.” I hear your pain, and the answers are no, no, and sometimes. Still, it makes sense that you have landed here. I hope you return. But lately, my favorite game with myself is to look at my site meter and pick out the oddest, most improbable searches that led people here. For example, just this morning someone found my site by typing in, Do prunes taste like plums? Now, this kills me. Why would anyone type that? Why not just eat a prune and find out through your own sensory experience? But, well, if that unknown person is still on that search, then yes, prunes do rather taste like plums. They are plums. I have been having such fun reading these ridiculous searches that I thought I would share a few with you…. There are an inordinate amount of hits from the Middle East, at least ten a day, for the phrase “Free Girl.” I can only imagine this site is a terrible disappointment to them. That is, except for the one person in Iran, last summer, who came by one day, then returned to this site every day at the same time for at least three weeks. Maybe he has celiac! That is the ineffable question, isn’t it? Hop on one foot while spinning counter-clockwise, singing to her in Swahili. Why does anyone want to see this? I still receive at least one of these a day, as far as I can tell. And by the way, in response to the soldier in Iraq who asked me to send him more photographs of my broken ankle from last year? I’m sorry, no. Ew. That was one of my dreams as a kid. It never came true. This one truly terrifies me. There won’t be any of that on this site! Finally, to the person who reached my site by googling, “I just had to come by” — I’m glad you did. I hope I didn’t disappoint. p.s. Just as I about to post this, I clicked over to read some of my favorite food bloggers — another excellent way to procrastinate against writing. To my delight, I found that Shuna from Eggbeater put up a post yesterday about this same odd phenomenon. Shunas and Shaunas — they think alike. Gotta say, never met a writer who didn’t know how to procrastinate. I think it’s a permanent part of the writer’s toolkit. I kept getting nuked girls on TV as one of my search phrases at one point. Guess it kinda matches with your girls on fire. See, this is why women and men will never understand each other. What’s sexier than a broken flaming ankle? Of course prunes taste like plums…yeah,dried ones. That’s like ….duh!!!! I think your blog is great fun. I saw something on the food network. I was busy doing something else while my daughter (the wanna-be chef) was watching her boyfriend, Alton Brown. I heard “Gluten Free Girl”. That sounded fun so I googled you. I think that people eat way to much gluten and we eat no wheat in our household. We are from Lopez Island and are on the East Coast in NY for the winter. Looking forward to more fun reading…. I just have to shed some light on the “gimmick sunglasses blowtorch” search – it really isn’t as strange as it sounds: it has all the hallmarks of an attempted googlewhack (and though it was a nice try, it was sadly unsuccessful, with 276 hits). I’m sure you know what googlewhacking is – it’s one of my favorite procrastination techniques (be careful if you give it a try. . .it is almost guaranteed to enthrall genuine word-lovers). . .and just for the record, I’m not responsible for “gimmick sunglasses blowtorch”. This post was so funny to me, b/c I do the same thing… checking on vistors to my site! I know how to procrastinate too! I just wanted to write you, b/c I just had lunch and it was one of those “Oh, God!” moaning moments while tasting my lunch and I thought of you! You talk about doing that all the time, especially when the chef cooks for you, but I rarely do that with the food that I eat. And the funny part (I know the chef will appreciate this) was that I need to go to the store and had next to nothing in the kitchen to eat, so I threw together a very simple pasta with a fruity olive oil, smoky bacon and fresh thyme from my garden, lots of garlic, parm cheese, and toasty pinoilis… oh, MAN! Now, I know what you mean… and I feel so satisfied. Thank you for helping me know how to express that experience ahead of time! Hm, I love prunes but they don’t taste like plums to me. But did you hear about how Sunkist is on this mission to re-brand prunes as “dried plums” to make them appeal more to younger folks? Most of their packages now don’t say “prunes” on them. Marketing is fascinating. Great blog– and congrats on the book. It’s the letter S. It’s special, succulent, savoury, salty, sweet, spontaneous, silly, sappy, sprightly, sensitive, and just plain s’wonderful! btw, “heatmiser” was the lovely band of the late elliot smith, before he went solo.